Kristen Stewart was not really known for being stylish but recently Glamour Magazine named as the Best-Dressed Woman of 2012. Though Kristen Stewart enjoys a different taste of style when it comes to the red carpet or photo shoots she really knows how to dazzle. Her fame and incredible popularity with kids and teenagers makes her the covergirl of reputable glossies again and again. Now with her two movies – Snow White and the Huntsman and On The Road – coming out Kristen is again in the spotlight, even more than when she starred in the Twilight Saga. Kristen Stewart, who has been called a ‘fashion pariah’ in the past, is now praised for her down-to-earth style in real life and ‘sophisticated’ (which is questionable) one at special occasions. 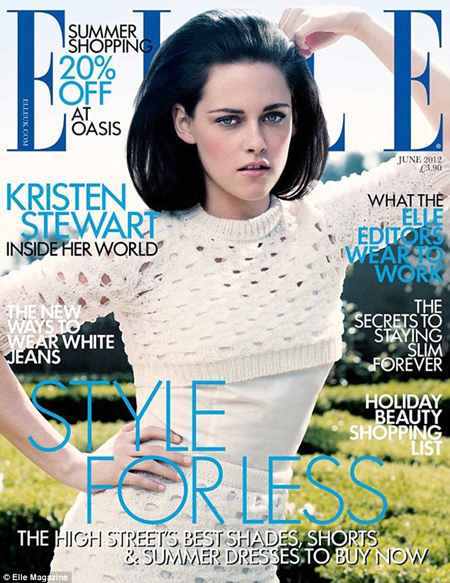 And she appears on the front page of Elle UK June 2012 issue. 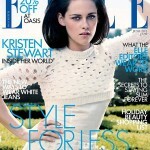 Wearing Jil Sander on the cover of Elle UK June 2012 issue Kristen looks rather good. I can’t say that I’m impressed since I still see how uncomfortable the actress is in front of the camera, but at least she’ s trying. And actually she’s a little better than she was in the very beginning of her career.